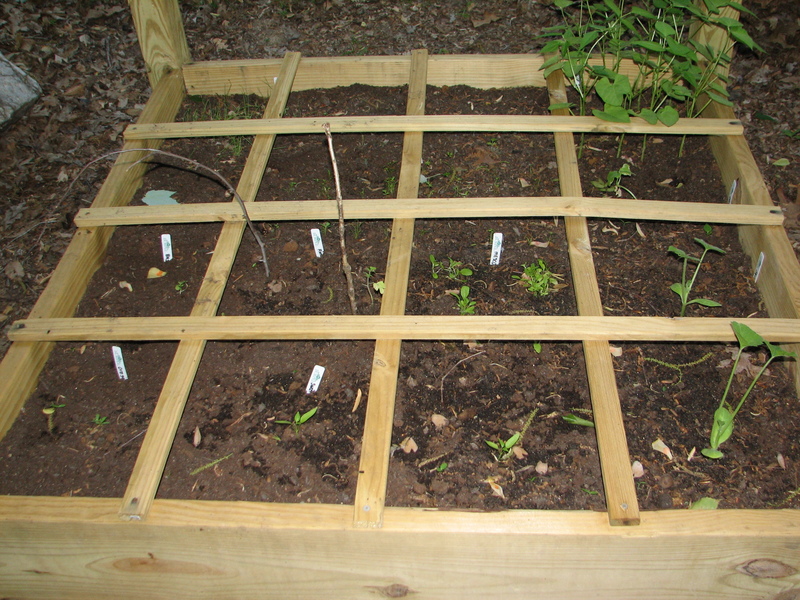 I’ve planted all of my squares. The green beans are doing really well. See them in the upper right hand corner. I’ve had to replant the tomatoes because something is getting in the garden and moving them. The green beans, squash and zucchini plants were planted directly in the garden and are doing really well as I hoped. The cucumber, tomatoes, cilantro and basil (too cool to plant) aren’t hardy with the strange temperatures we have had. Some days it is hot and other days it is cold. I’ll be planting in pots to sit around the garden that deer and other animals don’t like. mint – since it takes over I’m not sure exactly where in my yard I want to plant it so for now it is going in a pot. To add to my costs from my previous posts is I’ve bought a lot of seeds. Thanks to reading the Square Foot Garden book I’ve learned that I can store the seeds in a cool dry place in an air tight container and the seeds should last for years. So I bought lots of seeds for 50% off and more. Click HERE for a great list of companion plants. These are plants that like to be around each other.